When dealing with such an iconic food, it’s usually best to prepare it simply. It’s a treat, so make it shine that way. This very simple soup brings out the best in asparagus. 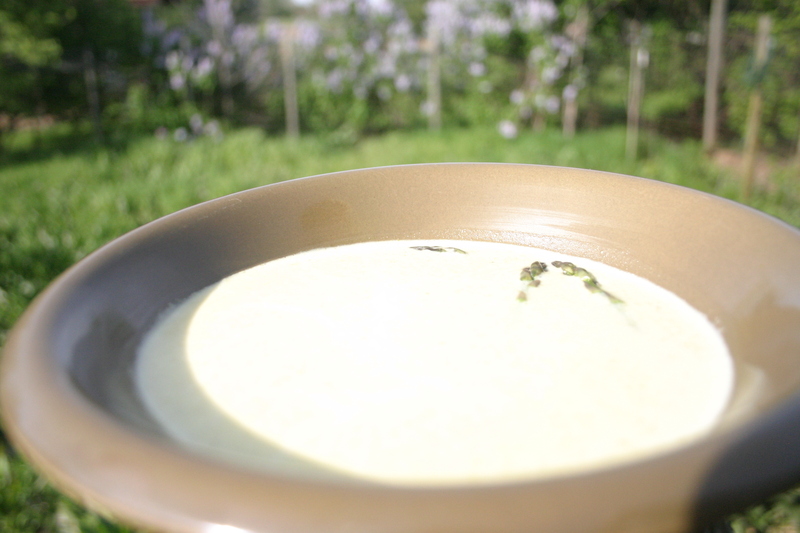 A simple soup to celebrate the first garden produce of spring! Serve hot or cold, but savor it however you serve it! Cook the asparagus in enough stock to cover over medium heat until tender. Puree with an immersion blender, or in batches in a blender. Melt the butter in your favorite soup pot, and blend in flour to make a roux. Stir in the cream and bring to a simmer over low heat, stirring constantly for about 3 minutes to thicken. Stir in the asparagus puree and the remaining chicken stock, and simmer for another few minutes. Adjust seasoning to taste. Serve hot or cold, garnished with a couple of asparagus tips.